It’s been a long time since a game truly felt like a reward to play after a hard day at work, but with the release of Borderlands 2 on September 17th, I finally got to come home excited to play something. The best comparison I can make is the feeling of going to a club and just losing yourself in the music because that same feeling is what Gearbox was able to deliver in this sequel along with a fix for everything that players had issues with in the first game. From the beginning of the game all the way through the finish, and even the replay, I was constantly experimenting and evolving my gameplay style. Nothing got stale, and every kill was more satisfying than the last whether it was by chain stabbing people as the assassin, Zero, or unloading four hundred incendiary rounds from a sub machine gun into a wave of enemies in approximately two seconds as Maya, the Siren. Just the same though, the game doesn’t pull any punches, and anybody buying the game should be prepared to have the game rip out your heart and sauté it in your own tears especially if you played the first Borderlands. Gearbox certainly didn’t pull any punches in making this game a memorable experience whether you play alone or with a friend or three. If you normally play games alone though, I might stress that the game is easily one hundred times better with a friend because you actually have someone there to exclaim and laugh with as the ridiculous antics of Jack get progressively more homicidal. It’s simply a better experience when shared with someone else, and I think that can be said about a lot of games. 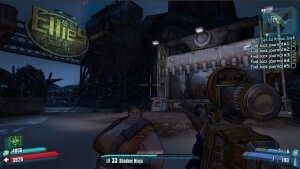 Gearbox certainly did a remarkable job when it came to gauging their players’ moods, emotions, and adrenaline. The game never once ended an emotional peak incorrectly and it was a fantastically smooth ride throughout the game. For those of you who aren’t familiar with the play style, let me explain a little bit. You end up on a planet, which, for all intents and purposes, is lawless and is inhabited by bandits, hick colonists, and a whole lot of bad asses with more guns than you can imagine. Every living thing on the planet, and even most inanimate things, has a gun you can rip from its obliterated remains. As long as you have a weapon you can get a better one and that mechanic combined with a nearly infinite number of guns gives you a constantly evolving style of gameplay, which Gearbox deserves to be extremely proud of. I’ve found in my experiences that cooperative gameplay is a nesting ground for glitches, the most memorable and entertaining of which would probably be from Fable 3 if any of you have played it. 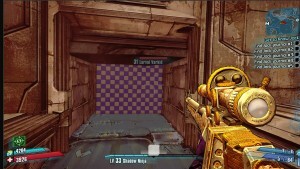 Borderlands certainly didn’t have anything on that level of ridiculous, but they did have some. My partner and I did occasionally have issue reviving one another even when we were practically standing on top of each other, which often resulted in the death of one or both of us. This wouldn’t be such a problem if it didn’t happen most often in the Circles of Slaughter half way through one of the last waves of enemies. It definitely caused a lot of frustrated groans and ice cream breaks were completely necessary after those happened. The UI had its frustrations too, of course. I found that having the “dismount from vehicle” button and the “travel” button on the same key caused a lot of unintentional dismounts and often ended in my partner and me running on foot looking for a new Catch-A-Ride Station when we got to a new zone. This game was also the first game ever to actually keep me entertained and interested in every side quest. For once they weren’t just another way of grinding out levels and instead actually brought more depth to the game’s phenomenally designed NPCs. My favorite side quest involved a string of tortured souls leaving messages behind referencing a gun with an unimaginably terrible curse that I won’t spoil for you so that you can discover on your own. Just know that it’s totally worth the side quest, and you’ll probably end up throwing the gun off the highest cliff you can find. If you know what quest I’m talking about, you’ll understand why I’m going to mention the sound of the game next, which was extremely satisfying from headshots to gun fire effects. Most of all the character voice was spot on and unique for every major and minor NPC. I was also a huge fan of the smooth gradient transition from normal voice to radio voice when you walk away from an NPC who’s talking. That way you don’t have to just sit there absently while the character gives you the mission and its backstory. I’ve never enjoyed, in real life or games, when someone wastes my time and I really appreciate it when the game company takes that into consideration. I’ve got some questions though. The New-U stations are Hyperion owned and Jack is owner of Hyperion, yes? He spends the entire game trying to kill you off and any time you do actually die, you use a Hyperion New-U Station to resurrect. That just seems counter-productive to me. A lot of games play off the dying thing by having you play from a save point as if you never died, but Borderlands turned it into a mechanic that they flaunt. Personally I think that they should have just slapped a different company name on the New-U station and called it done, but they kept Hyperion on it and it confuses me. The tech trees were also stuffed with great new innovative mechanics to have fun with, but a few were less effective than others. Clearly the game is about guns, guns, and more guns, but when you have a tech tree that builds melee skills from level five and upwards I expect melee to be a viable option and a play style I can enjoy from the first point I put into the tree. Instead, melee generally becomes useful around level twenty to twenty five. Of course, it’s not really an issue in the end because you can re-spec your talents for a more than reasonable price so you can level up with guns primarily and switch over in your thirties to the melee-centric tree to at least try it out. The level design of the game was well laid out. With that said, my co-op partner and I continued to run into small collision volumes that just had no business being where they were. Suddenly when driving the Light Scout we’d just find ourselves doing random one hundred and eighty degrees spins accompanied by a crashing sound when nothing was in the road at all. We also ran into a bit of an issue with some forgotten UDK material and texture applications as you can see in the picture below. This glitch, if it really was a glitch, really seemed almost more like an easter egg homage to UDK so I’m really not that bothered by it. Overall, Borderlands 2 is the perfect response to any emotional situation you might be having. It’s a perfect way to let out aggression when you’re mad. It will make you laugh when you’re feeling down and, once you’re feeling better, you’ll continue to have a good time for as long as you want to play the game. 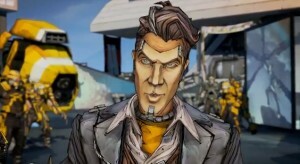 Best of all, Borderlands 2 has tons of content and I assume the DLC will be worth waiting for. It certainly doesn’t get stale and is a perfect game if you want to invite some friends over with their laptops for a good old fashion LAN party.